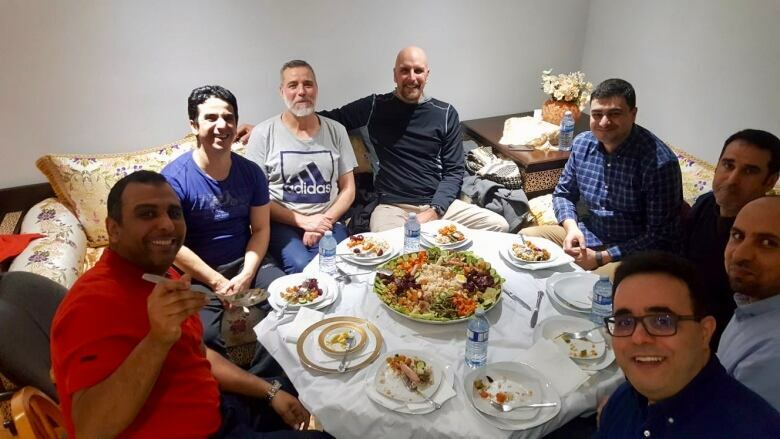 Survivors of the deadly attack on a Quebec City mosque in 2017 have been travelling around the world, providing support to other victims who live through similar trauma, thanks to the support of the organization One World Strong. ​Hakim Chambaz describes the year that followed the Quebec City mosque shooting as "the hardest period" of his life. "It was not good for us. We kept trying to hide, tried to avoid people, avoid public places," Chambaz said of the dread he and other survivors faced after Jan. 29, 2017. He was inside the mosque the night Alexandre Bissonnette walked in, killing six men who had been praying by his side at the Quebec Cultural Islamic Centre. Two years later, he says the pain he carried isn't as raw — his open, genuine smile proof that Chambaz has indeed come a long way. 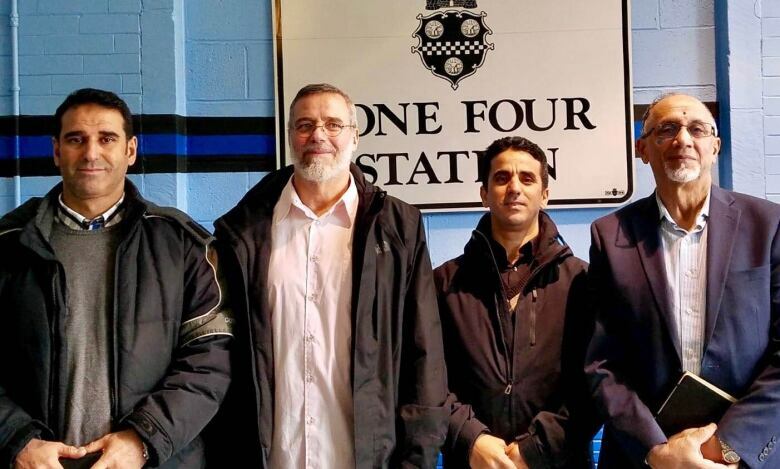 He attributes his recovery to a meeting with members of the organization One World Strong in January 2018, when the group travelled from Boston to the mosque for the one-year anniversary of the tragedy. One World Strong was founded by survivors of the Boston Marathon bombing of 2013 to reach out to victims of terrorist attacks, hate crimes or traumatic events. Three people were killed in that attack. More than 260 others were wounded, including Celeste Corcoran, who lost both her legs just metres away from the finish line. Chambaz said meeting Corcoran gave him a new outlook on life. "I thought to myself, 'I have both legs, food and I can go and work out — and this person has lost her legs and she's come just to encourage me,'" he said. Dave Fortier, another survivor of the Boston bombing, also made the trip in 2018. He was back this week for the commemorative events of the second anniversary, which took place at Université Laval last Tuesday. Fortier said once people meet in this kind of context, long-term friendships are made. "There's a bond that takes place between people that have that have experienced a similar form of trauma," Fortier explained. "It's one thing for a doctor or a nurse or a therapist, or even a family member, to tell you that you're going to be OK. But when somebody with a similar injury comes to you and talks to you about what they've experienced — it helps to condense your healing process." Fortier also received that kind of support in the days following the Boston bombing. Groups of veterans visited the wounded in hospitals and rehab centres, recognizing the injuries they had encountered in combat. "We were visited by several political figures, actors, actresses, music stars. But those were one time visits. These veterans kept coming back, they became a part of the family," he said. After the shooting at the Orlando Pulse Club in June 2016, which left 49 people dead, Fortier and nine other survivors from Boston travelled to Florida to meet with victims and their families. On the plane ride home, Porlier said he was amazed at the relationships he'd built with strangers in such a short time. "We got back to Boston and we started looking for an organization that does this, and we couldn't find one anywhere in the world — that reached out across borders, across politics, across religions," Fortier said. Soon after, the group put in place One World Strong. "We're not doctors, we're not therapists, we're not nurses. We're just folks that have experience something similar." Chambaz is now doing visits of his own with One World Strong. Along with other survivors of the mosque shooting, he travelled to Boston for the five-year commemorative event in 2018. 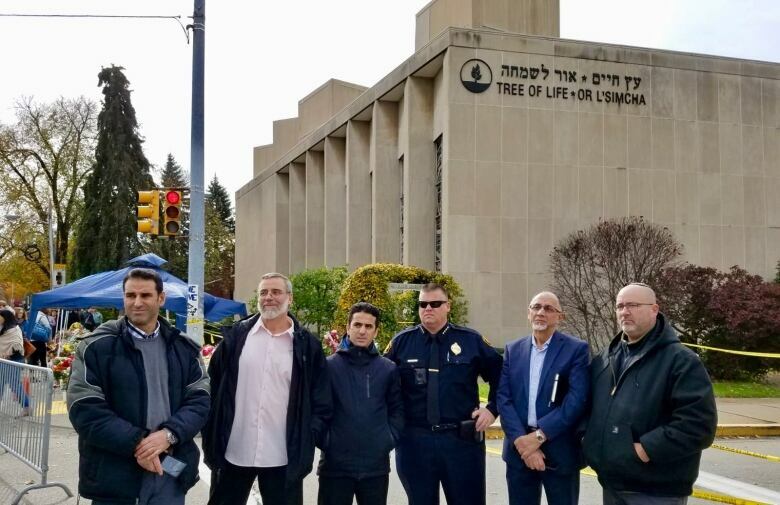 A group also drove to Pittsburgh last year, after a man stormed into the Tree of Life synagogue in Pittsburgh, killing 11 people. "We have the same context. A mosque, or whatever, a synagogue, a church, it's the same thing," said Chambaz. He has also travelled to London, England last summer, to meet survivors of the subway bombing of 2005, as well as Parkland, Fla., where 17 people were killed at a shooting in a high school. In addition to encouraging people during these traumatic moments, Chambaz sees it as a path to healing for himself. "It was great feeling to help a person find peace, from all over the world," said Chambaz, who will be paying a visit to his friend Fortier in Boston in April, during the annual Marathon.